Fabulous luxury villa with private pool, spa and super extended sun deck. One of Watersong's most popular villas, just 15 minutes from Disney and situated on a peaceful gated community. 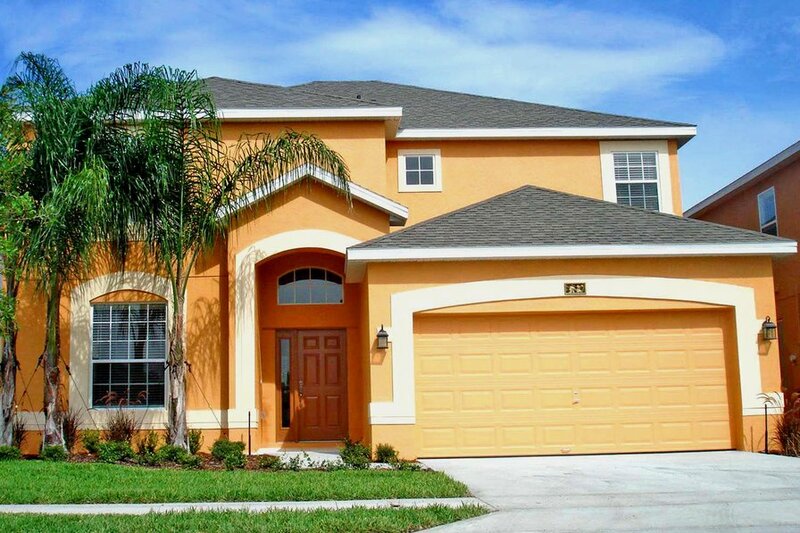 Situated on the lovely Watersong gated Community, 15 mins from Disney and just 30 mins from Orlando International Airport, our luxurious 5 bedroom, 4.5 bathroom villa is available for your dream holiday. Featuring a super extended sun deck, one of the largest on Watersong, backing on to a tranquil conservation area full of Florida nature, and with a lanai to provide shade when you want it. You will adore the spacious living accommodation, digital cable (with free British soccer so soccer fans don't miss a thing! ), TVs in all the bedrooms, having fun in the games room, the free wifi, free worldwide telephone calls and the benefit of Watersong's wonderful resort facilities. FREE TELEPHONE CALLS TO OVER 60 COUNTRIES WORLDWIDE!! All the bedrooms are upstairs, to keep the ideal separation between living and sleeping. The villa sleeps 10 guests comfortably and we also provide a cot (and high chair) free of charge for a little one in your party. All bedrooms have ceiling fans and there is air conditioning throughout. Huge extended sun deck - one of largest at Watersong! West facing to beautiful Florida sunsets, with sun on the deck nearly all day long! Crystal Palm Villa is fully registered with the Florida State Tourist Authority and our friendly and super efficient local management company ensure the cleanliness and maintenance of the villa are second-to-none, ensuring a care-free vacation. No wonder so many of our bookings are from repeat guests or from recommendations. Once you have stayed once you will want to return, and tell friends and family all about it! You will be staying a short drive from dining, shopping and entertainment. All the essential amenities such as supermarkets, bank and petrol station are conveniently close too. Set in a conservation area in the vicinity of clear lakes, Watersong offers a tranquil retreat from the theme parks. You will be able to relax in or around your own private pool, with views of Florida nature as your backdrop. Or make use of Watersong’s elegant clubhouse, internet café, gym, community pool and spa, volleyball court and kids play area, all free of charge during your stay. Close proximity to all Orlando’s world-famous attractions, exceptional shopping, easy access to Interstate 4 and numerous top notch golf courses makes Watersong the perfect venue for your Florida dream vacation. Golf: Central Florida, and in particular the Orlando area, has an excellent choice of golf courses open to the public. Renting our vacation villa at Watersong will give you access to more than 60 golf courses all within a short drive. The choice of golf courses in the area is probably only beaten by the amazing variety of family entertainment that Orlando has to offer the holiday maker. In fact, the best golf course within ten minutes drive from Watersong is the world famous Reunion Golf course at Champion’s Gate, where the Ladies PGA tournament is held every March/ April. The latest addition is the Providence Golf course, situated only half a mile away. When you add all year round sunshine to the variety of golf courses you will find Orlando hard to beat as a base for that perfect golfing holiday. Not only will you discover great golf courses but you will find the very best instructors and competitively priced golfing goods in the many golf outlets that populate the area.